18-3-204. 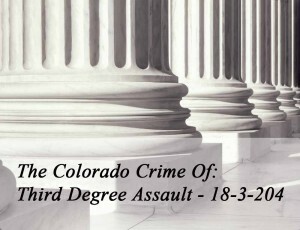 Assault in the third degree. material by any means, including throwing, tossing, or expelling the fluid or material. peace officer, firefighter, emergency medical care provider, or emergency medical service provider. is subject to the modified sentencing range specified in section 18-1.3-501 (3). 4. caused bodily injury to another person. 5. by means of a deadly weapon.